John, 75-years-old, was admitted to Jupiter Rehabilitation Center with a right below the knee amputation. He is originally from St. Petersburg and relocated to Port St. Lucie, Florida in 2013. He admitted to our center due to a recent amputation of his right leg. John contracted gangrene in the past and subsequently had to undergo an amputation to save his life. The first month of John’s stay at Jupiter was tough for him considering his health, circumstances, and outlook. 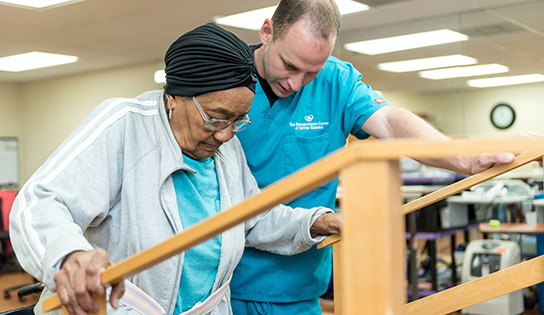 Mr. Reno stated “what brought me out of my devastation was the love and constant support I received from my CNA, Shawn and his faith in God.” Slowly he began to see the possibility that with therapy he could walk again one day. His optimism spurred from our team’s support and motivation to become stronger than ever before. John was a high-spirited individual who had done exceptionally well during his rehabilitation journey. Upon admission, he was not motivated about being a patient or participating in physical therapy. Our wonderful therapy team worked daily with John, motivating and encouraging him to keep going and reminding him that he was doing an outstanding job. Mr. Reno worked a lot with Renee in therapy and shared that he was very thankful for all the skills she taught him. Renee’s pleasant personality during treatment sessions were of course an added plus! At the time of evaluation, John was moderate assistance for transfers and minimum assistance for bed mobility. He was unable to ambulate, secondary to pain at the end of his leg and he also had poor standing balance. After four weeks of preparation (for fitting prosthesis), the golden day finally came and John was prepared to try on his prosthetic leg and begin his journey. John’s face of happiness couldn’t be denied. He shared that he couldn’t believe that he was finally standing again using a rolling walker. The first few moments were spent donning and doffing his prosthesis to ensure he would be able to do so independently in the future. John shared with the team that he was an avid fan of Harley Davidson and has been riding “Harleys” for the past 50 years. When he received his prosthetic leg he was ready to personalize it and place some “really cool Harley Davidson stickers on my new prosthetic and cane.” John was also pleased to have received support from Dennis Oehler and Todd Schaffhauser, the leaders of the Comprehensive Amputee Rehabilitation Program. Oehler and Schaffhauser provided guidance, training, mentoring, and skilled lessons to John throughout his stay at Jupiter. After two months of intensive therapy, John continued to participate with great enthusiasm and effort as he was preparing to return home! Nearing his official discharge date, John was deemed independent with bed mobility, transfers, and ambulation with support of a cane.